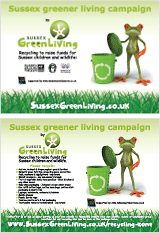 Sussex Green Living is calling for local people to help landfill families in Manila, Philippines and it won’t cost you a penny. Read on to learn how…. Recycling. We know we have to do it and we are reminded regularly of the need to keep plastics, food and textiles out of our landfills. Of course, this is the right thing to do, it keeps greenhouse gas emissions down as well as reducing our consumption and energy usage. However, just as it’s so easy to feel removed from the effects of our wasteful activities, recycling can be seen as having less tangible benefits. Many people are still sceptical that our home recycling even gets sorted and properly recycled at all! Well they do of course, or certainly in Sussex, but what if your recycling efforts were proven to be actively helping disadvantaged people abroad and in the UK? 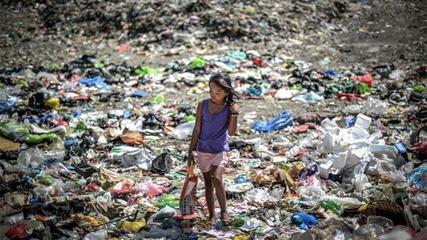 Would that spur you on to re-engage with your waste? Well that opportunity is already here! The Purple Community Fund (PCF) is a UK registered charity that has a mission to ‘permanently improve the quality of life for the poorest Filipino communities, through education, nutrition, health, medical and family enhancement programs…’ The charity focuses on 5 slum areas close to city rubbish dumps, where painfully young children, along with their families, search through the rubbish to find recyclable materials to sell. The PCF are doing amazing work providing schooling, health and nutrition services and skills training to these desperately poor families. To discourage the many children forced to leave school and go back to work on the rubbish dumps, the charity has set up a ‘food for learning’ scheme, where children can earn food allowances for attending school and for academic and behavioural achievements. This has seen a staggering increase school attendance, and has been extended to the adult skills training classes to improve attendance there. In order to fund this amazing work, the skills classes teach underprivileged Filipinos to make jewellery and other objects out of recycled materials that have already been diverted from the dumps. Rings pulls are turned in to amazing bracelets and glossy magazines become beautiful beaded earrings, bracelets and necklaces. Juice packs (Tetrapaks) are sewn into aprons and UK toothpaste tubes go towards making cute cosmetic bags. The revenue collected from selling these items goes straight back to educating the young child, who were previously dump workers. This inspiring work is now being launched in the UK, with projects to help vulnerable people closer to home being planned for 2016. The aim is for disadvantaged UK citizens to make bespoke items that the Filipino communities can’t produce, getting valuable work experience and learning new skills, and they need your help! The PCF are desperately seeking donations of aluminum ring pulls, empty toothpaste tubes and old holey jeans from the good people of the UK! Donates can be delivered to the addresses below. Please do pop the ring pulls into bags before putting them in the collection bins! Learn about other materials you can divert from landfill into our special recycling scheme here. Some of the locations can only collect ring pulls, we have indicates using this abbreviation: Any = any of the resources Ring pulls – only aluminum ring pulls please. 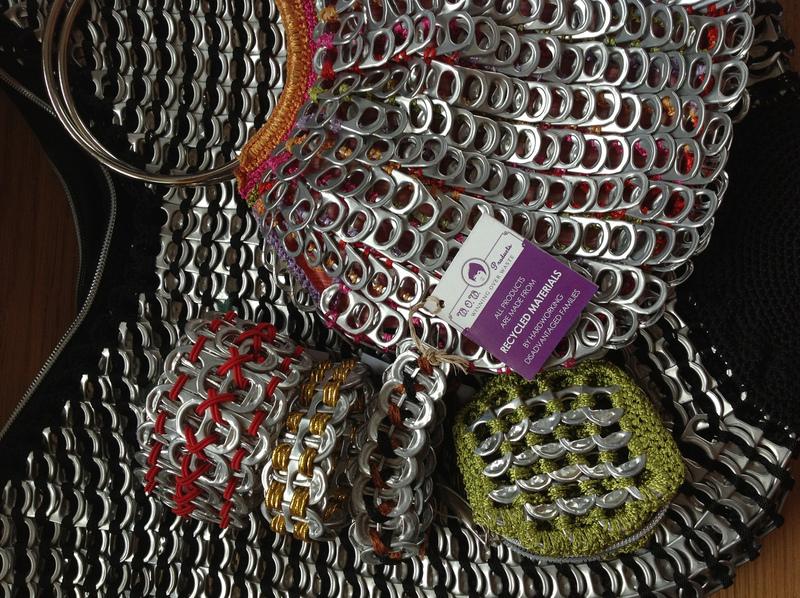 If you would like to see the benefit of your recycling efforts then we hold a stock of the beautiful PCF jewellery, bags, aprons, purses etc. We sell them with the full proceeds going back to the PCF, through coffee mornings, giving talks on recycling and inspirational upcycling with a sale at the end. 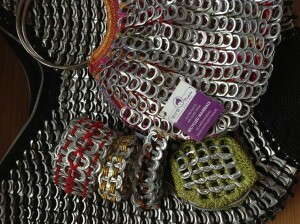 We also take out our Green Recycled Stand to local shows and events where people can buy these stunning goods. Please drop us a line if you would like to invite us to a coffee morning, event or to give a talk. Our contact details can be found here. For further information about the work of the PCF, or to find out more about organising your own ring pull collections please go to http://www.p-c-f.org/.